Holotype: BMNH 85.12.10.1, adult ♀, body in alcohol. 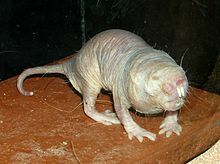 Heterocephalus glaber in Mammal Species of the World. For more multimedia, look at Heterocephalus glaber on Wikimedia Commons. This page was last edited on 10 March 2019, at 17:33.